A New Yorker won the Mega Millions Jackpot of $321 million on 4th November. The Mega Millions jackpot grew to $321 million over the weekend. That’s the eighth largest prize in the Mega Millions history. 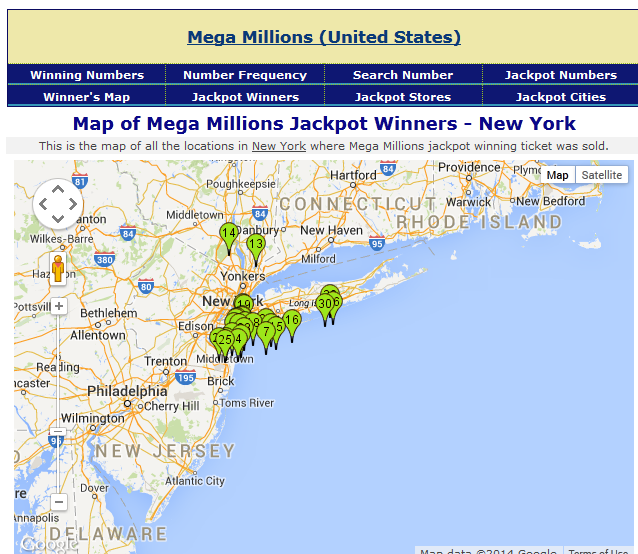 A winning Mega Millions ticket with all six numbers was sold in Middletown, New York state. The winning ticket was purchased at the Valero gas station at 258 Route 302 in Middletown. The ticket was worth $5 million more than the announced jackpot of $321 million due to the increased sales nationwide. The Valero gas station store will receive a $10,000 bonus for its role in selling the jackpot-winning Mega Millions ticket. A single winner would get $194 million if they chose the one-time cash payout or annuitized prize will pay exactly $321 million in 30 annual, laddered payments. The current jackpot has been growing since it was last won by 53-year-old Rick Knudsen of Calimesain, California. at $180 million on August 22 — 20 drawings ago. Mega Millions winning numbers for Tuesday, 4th November, 2014 are 9, 15, 24, 39, 41.The Mega Ball number is 01. The Megaplier number is 04.